Baked Crusted Parmesan Chicken, one of those 30-minute recipes that go well with all the members of the family. A lot healthier than the fried version, but as crispy and tasty. It really ticks all boxes when it comes to a quick midweek meal. Wonder what else to cook for dinner tonight? I know the struggle, especially if you come back from work and the last thing you want to do is start cooking when you’ve got loads of other things pending. But, believe me, as tempting as it may sound, take away food will prove to be not only more expensive, but the waiting will also be longer. 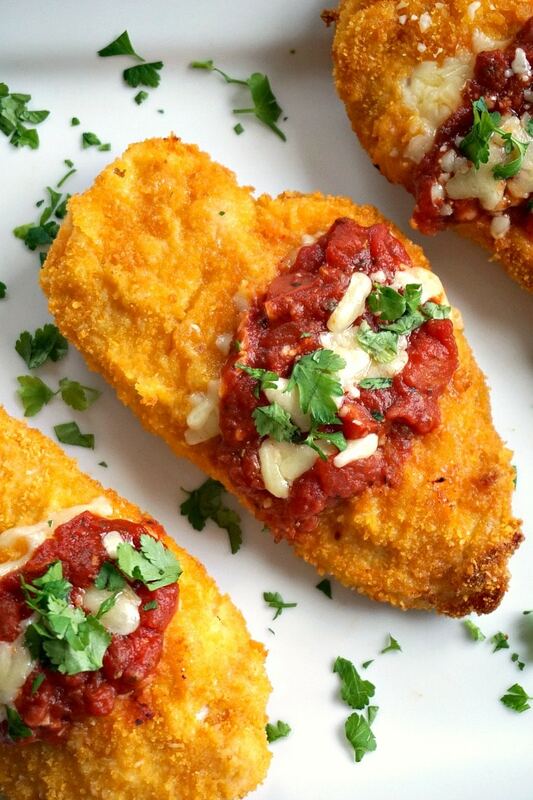 So why not have a quick easy chicken parmesan baked in the oven? By the time you give them a call, and get the order sorted, you may as well put this chicken in the oven. You can make the sauce while it is baking, thus saving time. Throw some veggies on the plate too, if you like, and that’s a proper dinner sorted. You’ll be licking your fingers clean and tell yourself that next time you’ll definitely be making a bigger batch. One thing that never misses from my fridge is cheese. We all love cheese in my family, including my 19 month old daughter who screams with delight whenever she sees me taking it out of the fridge. You should see the enthusiasm on her face, she can hardly wait for me to cut it up for her. Her favourite one is Cheddar cheese, but will gladly have other cheeses too. Mummy’s girl, hey! While she’s still not very sure of chicken, she does like to give this recipe a try, and that says a lot about how delicious this really is. If Amy approves of it, it has to be good, that’s for sure. One thing that helps keeping this oven baked parmesan chicken nice and crispy and prevents it from sticking to the tray is brushing some cooking oil spray over, then spraying some more on top of the chicken. Don’t bother with non-stick foil, it won’t really help, straight on the tray works perfectly fine. More over, foil can actually make things worse. Don’t worry about having to clean the tray after, it does not take too long. 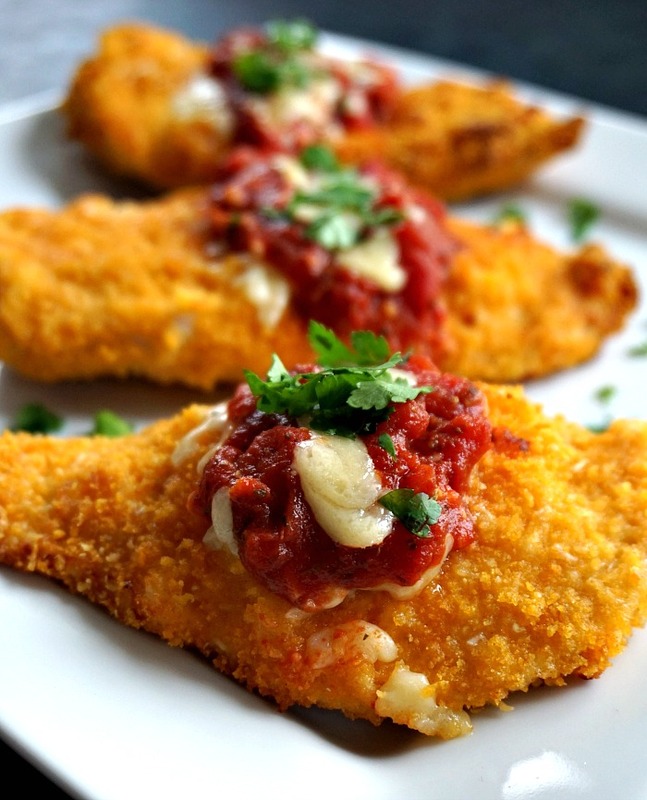 A very yummy and scrummy and super easy parmesan crusted chicken! Another big favourite of mine is the chicken schnitzel, worth giving it a try too. 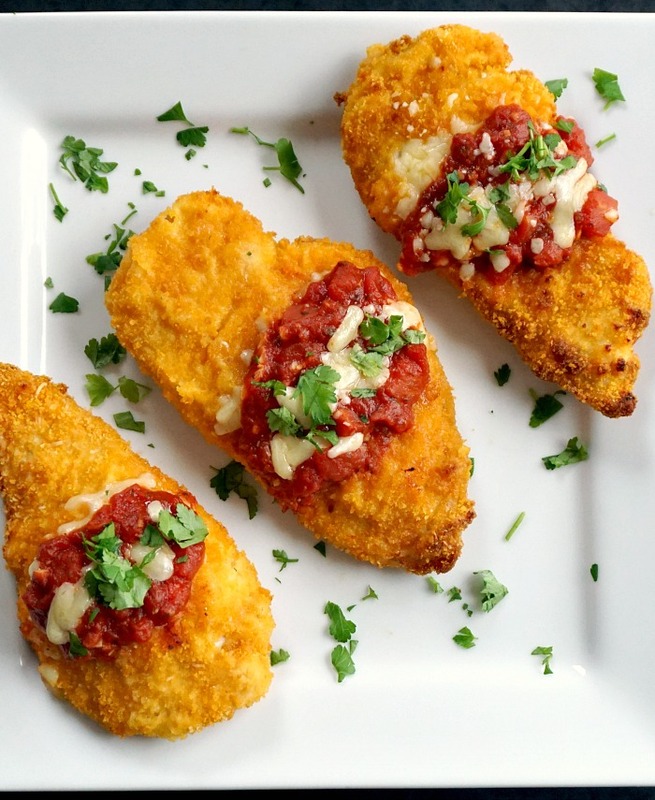 If you’ve tried my BAKED CRUSTED PARMESAN CHICKEN or any other recipe on the blog then don’t forget to rate the recipe and let me know how you got on in the comments below, I love hearing from you! You can also FOLLOW ME on FACEBOOK, and PINTEREST to see more delicious food and what I’m getting up to. Baked Crusted Parmesan Chicken, one of those 30-minute recipes that is loved by all the members of the family. 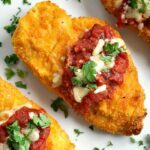 A lot healthier than the fried version, this easy parmesan crusted chicken is absolutely delicious. Add the flour to one dish, then mix the breadcrumbs with the grated parmesan, salt, pepper and garlic powder and add them to a separate dish. Another dish will be needed for the eggs, which need to be beaten with a pinch of salt and pepper until foamy, then water is added to it. Coat each chicken slice with flour, then dip it in the egg wash, and finally coat it well with the breadcrumbs mixture. Arrange them on an oiled baking tray, spray some more oil over, and bake in the preheated oven at 200 degrees C for 20 minutes. Meanwhile, make the sauce by adding the chopped tomatoes to a pan, together with the finely chopped garlic, spring onion and dried basil. Leave it to cook for 5 minutes, then remove from the heat. 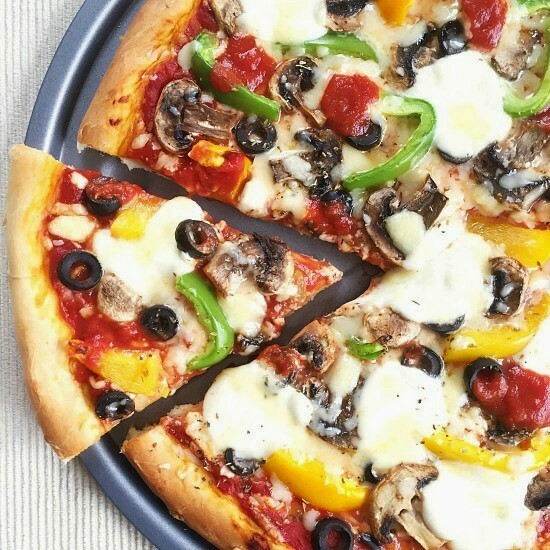 Once the chicken is ready, sprinkle some grated Cheddar over, add one tablespoon of tomato sauce over and some more cheese and pop it back in the oven for 5 minutes so that the cheese can melt nicely. Looks tasty. Thanks for sharing! Thank you, Chris! Always very kind!